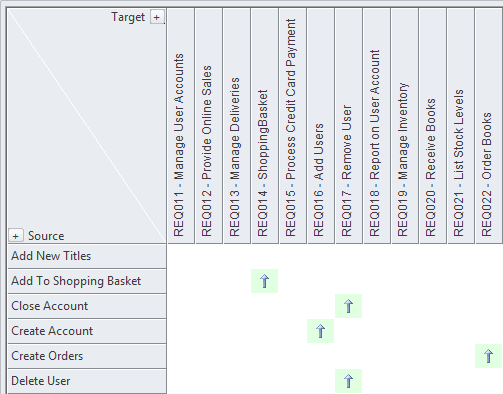 The Relationship Matrix is a tool for visualizing the way that requirements are related to each other and to other elements in the model in a visually compelling matrix or spreadsheet like view. It can be used to view the relationship between Stakeholders and their Requirements, how Use Cases are related to Business Requirements or Functional Requirements, how Capabilities are related to Business Drivers, which Components implement a set of requirements, and more. Any number of matrices can be defined quickly and then saved to be viewed in workshops or included in documentation generated automatically from the model or exported to a spreadsheet file. When a matrix is created, connections can be viewed by placing the Requirements on one axis of the matrix and the connected elements on the other axis, then the cells of the matrix will indicate the direction of the relationship. To display the relationships that exist between elements in two Packages in a visually compelling matrix, such as which requirements are realized by which Use Cases. It is useful in analyzing missing elements or relationships; for example, to determine which Requirements are not realized by any Use Case or which Components do not have corresponding Requirements or Use Cases. It is particularly useful in workshops with Business Stakeholders who might not be familiar with seeing requirements in Trace diagrams. 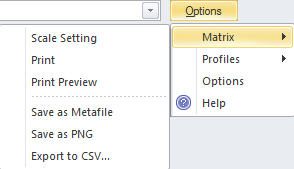 There are a range of options that can be set for the matrix including saving it to the Resources window or to a CSV format for opening in a spreadsheet. The appearance of the matrix can also be altered by sorting the elements, showing an outline numbering view, and suppressing Package names. These items are available from the Options button on the Relationship Matrix.